I've been dying to check out the BreadTalk IHQ since I pass by quite frequently. You can find all of BreadTalk's flagship Food & Beverages under 1 roof! Finally I found the chance to visit the place because RamenPlay recently unveiled it's new a la carte menu. You'll find that every outlet of the casual Japanese dining establishment delivers a different concept. They are characterised with different lightings and furnishings, creating an intimate yet inviting vibe. I frequent the one at Serangoon NEX, but prefer the interior at IHQ. 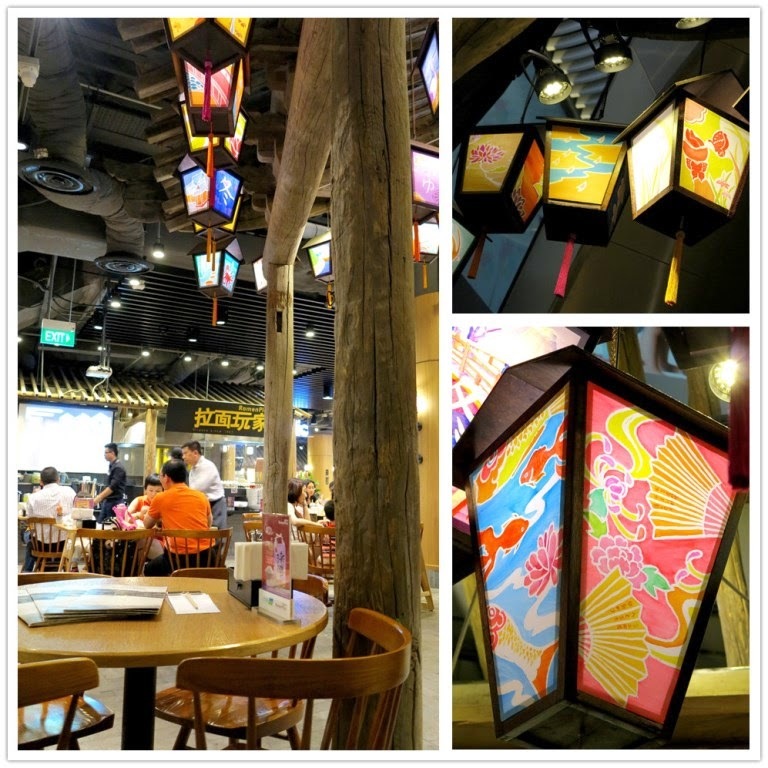 The gorgeously-lit lanterns and traditional Japanese ambiance alone is enough to lure me in to admire! If you've visited any of the branches recently, you'll realise that RamenPlay is no longer just about their quality ramen anymore. 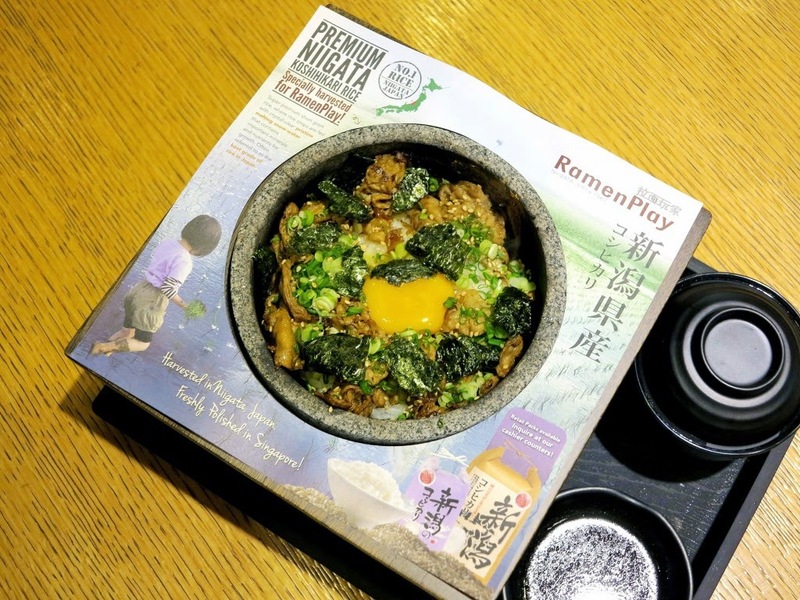 Constantly pushing the envelope to create new dishes that showcases the chefs' versatility in Japanese cuisine, you'll definitely fall in love with RamenPlay's latest offerings - wholesome Donburi (rice bowl) Sets! Though inventive, RamenPlay never forgets about retaining the classic Japanese flavours. The new Donburi Set section encompasses five hearty and affordable donburi sets that will leave you craving for more. Premium Koshihikari rice from Niigata prefecture are the secret to the new yummy donburi dishes. FYI, the rice are considered to be of highest quality in Japan, known for its distinctive flavour and sticky texture. You can purchase these bags of premium rice pearls at all of their outlets! There's a promotion going on! Purchase a bag of 2kg rice at $16.80* (U.P. $28) and enjoy a 40% saving of $11.20. *Prices stated are not inclusive of GST. The new donburi sets are available for lunch and dinner at $12.80, subjected to prevailing GST, and where applicable, 10% service charge. You'll be shouting "TAKE ALL MY MONEY!" because the Donburi Sets are so value-for-money! Not just the rice bowl, but it comes with side dishes as well. 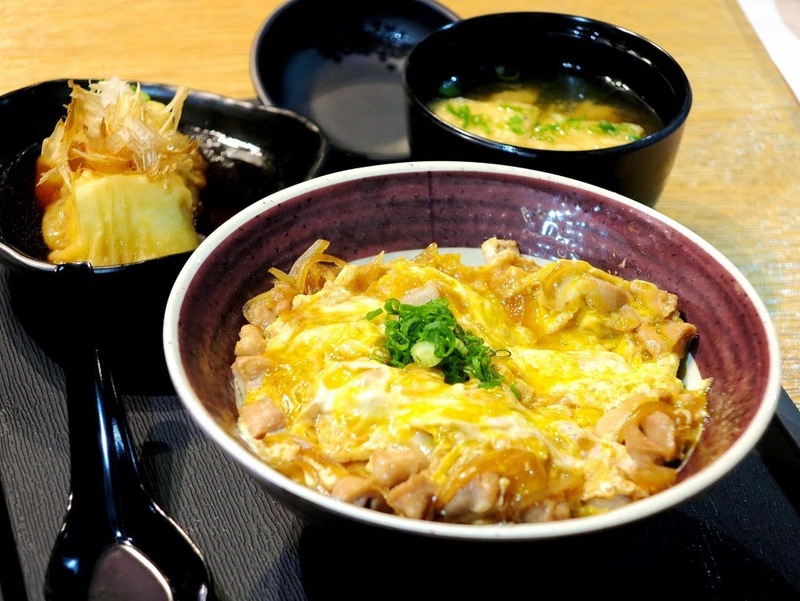 You'll love the sunny-yellow steamed egg and chicken lying atop a bed of Koshihikari rice on your Tori Momo Don Set. Served with Agedashi Tofu and Miso Soup, what added to the flavour was the special shoyu sauce! I love burst of flavours, so imagine my happiness when the egg was runny and sticked to the rice well. Chicken was tender and chewable, and I have to say that the sauce really completes the dish. Pan-fried and seasoned with the all-time favourite Teriyaki sauce, you'll find the chicken thigh on the Teriyaki Chicken Don Set supremely tender. What I particularly love was the sprinkle of crisp seaweed at the top. You'll also find Agedashi Tofu and Miso Soup at the side as well! You can't really go wrong with teriyaki, can you? I must add that the sides were better than expected. Not the obviously low-grade ones you find at Kopitiams. The Cha Shu Don Set has got to be one of my favourites out of the 5 new sets! It is topped with teriyaki marinated diced pork loin. But what steals the crown is the slow-cooked and oozing onsen egg! Mix all of them well for flavour burst in your mouth. I think it is perfect for the kids! This set is served with Miso Soup and Mini Salad at the side. The mini salad is tossed in Japanese sesame dressing, with extra crunch coming from the unique red Tosaka seaweed! It is known for its vibrant colour and nutritious benefits. Layered on the top are thinly-sliced grilled pork glazed with RamenPlay's special sauce, the Pork Yakiniku Don Set is a classic example of a simple yet memorable dish. You'll find an onsen egg in this dish as well! Mix it all together; you'll be back for your new favourite comfort food. It is also served with Miso Soup and Mini Salad. If there's rice, there's bound to be curry in a Japanese menu! 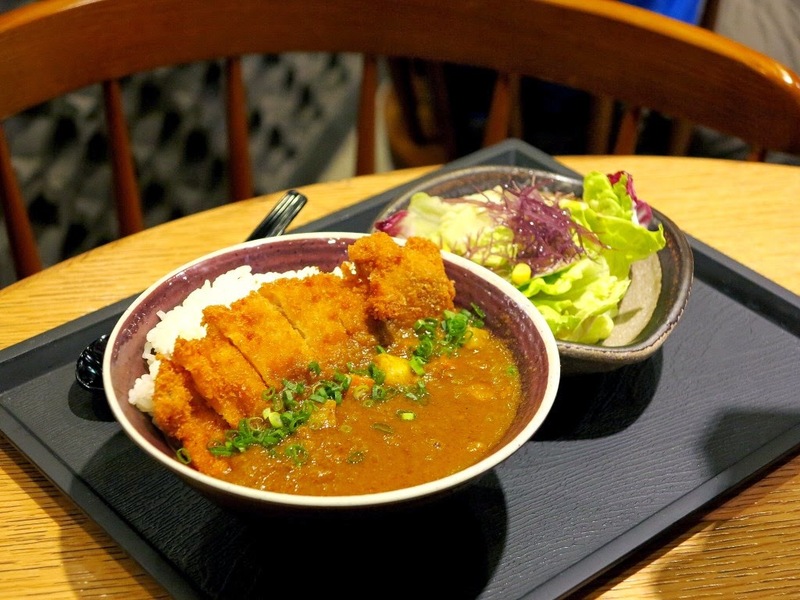 You have a choice of either the winning trinity of breaded pork or chicken cutlet for the Pork/Chicken Katsu Curry Don Set, lathered on top of vegetable curry gravy. Even though the meat is fried, it wasn't overly greasy at all. You know how some fried dishes are so oily, it's like you might as well just drink oil? Yeah, you don't find it here. In fact, what you will taste is indeed the juices coming from the meat! The curry is not spicy at all, I can forsee my little brother (who hasn't tried the dishes yet) loving this dish already. It is served with the refreshing Mini Salad. What could be better than sweet endings after a hearty and filling meal? 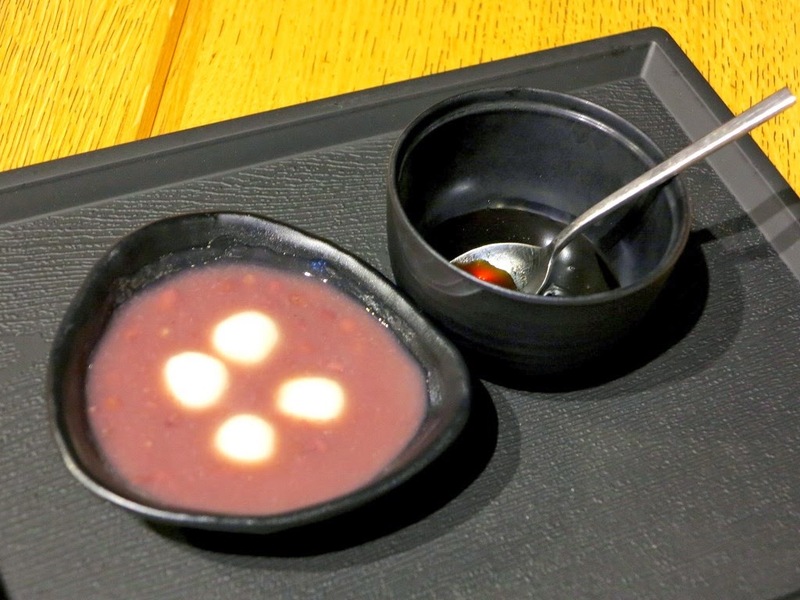 Also new on the menu, the Chilled Shiratama Zenzai ($4.80) features a comforting combination of chewy glutinous rice balls complemented with chunky Azuki bean paste. Served chilled, the light drizzle of sweet Kuromitsu sauce (brown sugar syrup) was what nailed my foodgasm spot. Life is bittersweet, as reflected on the all-new Warabi Matcha Mochi Ice Cream ($4.80). This standout dessert compromises of the Vanilla ice cream, azuki beans and matcha kochi cubes which are served warm upon ordering. Sweet and chewy, I find no reason why anyone would not love this dessert! Other than the new offerings, here are the all time favourites that you might be interested to check out as well. For a icy thirst-quenchers, the bubbly Super Yuzu drink is a 'super' for you! The citrus fruit is imported from Japan. Get this if you want a refreshing sweet zing! The handmade Yaki Gyoza ($3.60 for 3pcs / $5.80 for 5 pcs) are meat dumplings plumped with pork fillings, then encased in a thin wanton skin. Deliciously crisp on the outside yet tantalisingly moist within, it is skilfully pan-fried. You can polish off the delicately-wrapped dumplings with the accompanying house dip of shoyu and chilli sauce. New-found favourite of mine, the Crispy Dango ($3.60 for 3 pcs) is worth a try. It looks like takoyaki at first, but these are actually deep-fried juicy chicken meatballs. They are slathered with a winning combination of mayonnaise and plum sauce, kidnapping my heart one bite at a time. Uniquely Japanese style, the Butariki Ishinabe ($13.80) is served in a heated stone pot rice bowl. This is to ensure that it is enjoyed at the optimum temperature. This signature dish boasts both pan-fried and barbecued pork, spring onions, seaweed, raw egg and drizzle of RamenPlay's addictive secret sauce. Warning: it can be pretty hot indeed. Be prepared to get blown away when you mix it well with the pearly Koshihikari rice. House special Sanpou Tonkotsu Ramen ($16.80) consists of the springy noodles steeped in RamenPlay's traditional rich pork bone-based broth, piled with three different braised pork cuts. They are namely the pork jowl, pork belly in special sauce, and pork belly in Japanese Cha Shu sauce. It is accompanied by preserved bamboo shoots, a dash of spring onions, and half a braised egg with a runny centre that we all love! To be very honest, I went to RamenPlay without expecting much. I'd tried their food when they first launched, but only found it to be so-so. However, many years later the taste and quality showed a drastic improvement for sure! Especially the rice, my family devoured the entire bag I brought home. Taste the difference for yourself!